Our spectacular South Africa Wildflower tours explore the amazing seasonal wildflowers of Namaqualand and West Coast National Park & visit some of South Africa's famous botanical gardens - including Kirstenbosh Gardens in Cape Town, Harold Porter Gardens near Hermanus, the succulents of Karoo Botanical Gardens, the cycads of Lowveld Botanical Gardens and the orchids of Durban Botanical Gardens. Self-drive or let us tailormake a private tour for you. In Namibia you can view seasonal wildflowers in the Succulent Karoo and Madagascar also has amazing flora, including thousands of different orchids. Sri Lanka has a world class Botanical Garden in Kandy that showcases many different orchid species and India has many beautiful gardens. Each country in Latin America has its own special flora - Read more below. For expert advice on South Africa wildflower tours to Namaqualand & Kirstenbosch Gardens in Cape Town; Latin America & India contact our friendly team on 01582 766122 today. 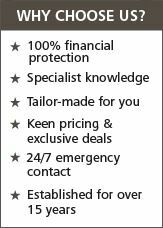 We can tailor make a holiday to your exact requirements. Selling South Africa wildflower tours for over 15 years. ALL OUR SOUTH AFRICA WILDFLOWER TOURS TO NAMAQUALAND & KIRSTENBOSCH GARDENS IN CAPE TOWN; LATIN AMERICA & INDIA ARE FINANCIALLY PROTECTED, wherever in the world you live. 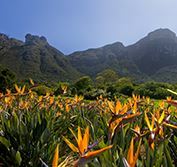 On one of our wildliflower tours you can visit some of South Africa's many stunning botanical gardens - including those on the popular Garden Route & the famous Kirstenbosh Gardens in the foothills of Table Mountain in Cape Town. To the southeast, at Betty’s Bay, the vast scenic Harold Porter National Botanical Garden near Hermanus, the famous centre for whale watching, is a must-see for all garden lovers. The garden boasts 1,600 densely concentrated varieties. 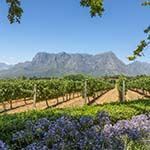 On South Africa wildlfower tours you can also take in the beautiful Cape Winelands at Stellenbosch. Self-drive is popular here and you can travel the entire 200-mile Route from Mossel Bay in the west to Storms River in the east. There are stunning botanical reserves all the way, but the Route offers much more, with an exceptionally rich diversity of plant life, forest and landscapes. For stunning seasonal South Africa wildflower tours, Namaqualand and the West Coast National Park, including the Postberg Flower Reserve, to the north of Cape Town are the place to go. 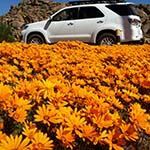 The outstanding floral displays in Namaqualand are considered to be one of the floral wonders of the world. West Coast National Park is also renowned for its seabirds and concentration of antelope and other mammals, not to mention passing whales and dolphins! For something a little different on South Africa wildlflower tours, especially for succulent enthusiasts, do not miss the Karoo Desert National Botanical Gardens. Just 75 miles northeast of Cape Town in Worcester, the greenhouses there are home to 3,000 varieties! In the north, Johannesburg boasts the renowned Walter Sisulu Botanical Gardens at Krugersdorp, based around the Witpoortjie Falls with its garden of palm-like trees and its succulent rockery. With 70 acres of landscaped gardens and 650 acres of natural vegetation, this huge park offers everything, including beautiful hiking trails. Not far away, the Pretoria Botanical Gardens include biomes with a superb selection of indigenous South African forest and savanna plants and from there you can take the fabulous Drakensberg Panorama Route as far as the Kruger wildlife park. On South Africa wildflower tours, do not miss the Blyde River Canyon, the third largest in the world. Further east, enjoy the Lowveld region’s Botanical Gardens, with their spectacular cycads, superb waterfalls and a pre-historic archaeological site. On the coast, the botanical gardens of the attractive port resort of Durban are famous for their orchids, and well worth including on all South Africa wildflower tours. Many African countries outside South Africa have established botanical gardens relatively recently, usually in the capital cities, which makes them accessible. Their objectives of conservation, research, education, eco-tourism and recreation are to be applauded and deserve support and publicity. In the country’s southwest you will find the Succulent Karoo region, which it shares with South Africa. This spectacular, arid landscape is home to a third of the world’s 10,000 species of succulents and you will find more in the National Botanical Gardens in the capital Windhoek, including many which are rare and endangered. The National Botanical Garden, situated at Gaborone, the capital, near the South African border is a much-heralded landmark achievement designed to promote the country’s indigenous flora. The beautiful site is arranged in six sections, reflecting Botswana’s six ecological regions, complete with well-preserved historical buildings. There are many gardens and parks in Zimbabwe, but the main attraction is the pleasant, well equipped National Botanic Gardens and Herbarium, located close to the capital Harare. Its 140 acres is home to 900 indigenous shrubs and trees and an equal number from Africa, Australia and Asia, many of them rare and endangered. The herbarium houses no less than 500,000 specimens. Just 11 miles away you can visit the Ewanrigg Botanical Garden, which is renowned for its world class collection of aloes - try to catch them in bloom - and cycads. The large Vumba Botanical Garden and Reserve is also close and well worth a visit. Harare Gardens is downtown, and with the National Gallery next door provides a serene and calm escape from the city buzz. On Africa wildflower tours, for something a little different don’t miss the well-stocked Kuimba Bird Sanctuary and park just outside the city. Lusaka the capital has many parks and gardens and the main botanical attraction is the Munda Wanga Environmental Park. This labour of love for its pioneering founder has an interesting chequered history, but is now a lovely, quiet combination of botanical garden and wildlife sanctuary. Unusually, there is both a wide range of indigenous flora and a varied collection of animals and birds recovering and awaiting rehabilitation and release. The recently refurbished Jardim Tunduru Botanical Garden in downtown Maputo, the capital, is a must see on Africa wildlflower tours. It is full of endemic plants and the quiet, beautiful sub-tropical surroundings offer a welcome break from the tourist bustle. There is also a thriving bat population in the gardens but if you prefer you can people-watch the regular colourful wedding celebrations. The best gardens are in the capital, Dar Es Salaam. The botanical garden here is a stunning, highly maintained oasis of peace and luxuriant growth, with an exceptional mixture of native and exotic species. These include the rare coco-de-mer, a palm tree from the Seychelles. The City Park is a major, central attraction in the capital Nairobi. With over 1,000 species of trees and flowers, a sculpture park and several historical sites, the park is a national monument. There is also a famous and well used bandstand and a large population of usually friendly Sykes monkeys! Just outside the city you will find the Botanical Gardens in the grounds of the Nairobi Museum. This is a lovely, peaceful and well-planned area which is cleverly themed to express Kenya’s natural and cultural heritage. Not to be missed on Africa wildlfower tours. Langata Botanical Gardens is a lush, green and beautifully maintained private park, some twelve miles outside the city, offering lovely tranquil surroundings. The country’s claim to botanical fame is the vast 1,700-acre garden at Gullele in Addis Ababa, containing around 700 endemic plant species. This superb, largely wild site is built on two levels, one of which at 1,800 metres is set beautifully among mountains. With its diverse forests and amazing sub-tropical flora, Madagascar could be viewed as one huge botanic experience. However for convenience you can visit the superb Antsokay Arboretum at Toliara on the southwest coast. This is a beautiful 100 acre, well organised and friendly park with 900 different types of plants from all over the world. You can also enjoy the local birds, insects, butterflies, lizards and lemurs. At the northern tip of the country, the vast Montagne de Ambre must not be missed on Africa wildflower tours. This extraordinary and beautiful rain forest reserve offers stunning scenery, with over 1,000 different types of plants including thousands of orchid varieties. 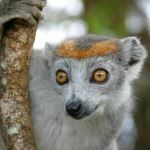 It is packed with wildlife of every description, including the ever-present and lemurs and chameleons. India’s innumerable beautiful gardens often include or are close to stunning pre-colonial temples, palaces, sacred and archaeological sites, many of which date back more than 1,000 years. Heading the list is the Indian Botanical Garden in Calcutta in the far east of the country. Within its 260 acres you will find 12,000 live plant species, including the some of the rarest trees in the world. The garden is home to a famous 250-year Banyan Tree, said to be the world’s largest and which on its own spreads its canopy over 3.5 acres! There are 2.5 million dried plant species and it was here that the tea now grown in Assam and Darjeeling was first developed. On wildflower tours do not miss the cactus house, the palm collection and the giant Amazon lily pads in this truly outstanding garden. To the northwest, in Uttar Pradesh near the Nepal border, you will find Saharanpur Botanical Garden, one of the oldest in India and a former centre of the first botanical survey of India done in 1887. The garden began before 1750 and now combines preservation and conservation with commercial development and sales. Nishat Bagh Garden is in Srinagar in Kashmir, next to the famous Dal Lake. The lake is actually a beautiful maze of intricate waterways and channels and not for nothing is it known as the Jewel in the Crown of Kashmir. It is said to be at its most stunning in July and August, when the lotus flowers bloom. The garden is variously known as the Switzerland of India and the Garden of Gladness and comes complete with a terraced Mughal garden built by the Muslim moguls who ruled most of India in the 16th and 17th centuries. A little further south, on wildflower tours do not miss the Pinjore Garden at Chandigarh, one of the most beautiful Mughal gardens in India. This charming and elegant garden covers 100 acres and is close to the stunning 8th century open air museum and archaeological site of the Bhima Devi temple. The Lodi Gardens in New Delhi are also a must-see. This famous 90-acre Mughal botanical garden contains not only an amazing collection of plants but outstanding Lodi tombs and domed architecture from the 15th century, when the Lodi governed much of northern India. A major attraction in the gardens is the tomb of Mohammed Shah, one of last Sayyid, pre-Lodi rulers, built in 1444. The tomb of Humayun, the Mughal emperor, is only two miles away. If you are heading for Mumbai, you must visit the nearby Empress Garden at Pune, the ‘Jewel of Pune’. This is a wonderful, sprawling 39-acre site which specialises in regional plants and many rare species of trees and flowers. While you are in Mumbai, see the Hanging Gardens, built in 1880 on the top of Malabar Hill. This large ornamental garden contains several hedges carved as animals, and the sunsets over the Arabian Sea are spectacular. On India wildflower tours you can also stop off at Sarita Udyan Garden, in Gandhinagar, Gujarat on the Arabian Sea. Because of its many lush parks and gardens, Gandhinagar is called the Green City and this large, city centre garden is the best. Visit the adjacent Deer Park, the beautiful Gandhinagar Lake and the serene undulating banks of the River Sabarmati for additional relaxation. Mahatma Ghandi was born in Gujarat and his home and many other sacred and historical sites are open for visitors. Heading to the far south of the country, near Bangalore, enjoy more superb Mughal architecture combined with a modern artistic twist at Lal Bagh. The garden boasts a beautiful plant glass house and is a renowned centre for botanical research. South of Bangalore, near Coimbatore & Ooty, lies the Government Botanical Gardens, famed as the greenest of gardens with a huge collection of roses. They grow 300 species in their 130 acres, and their famous fossil tree trunk is 20 million years old. In May you will witness their amazing annual flower show. This is one of India’s major tourist attractions, with a terraced layout in several beautifully planned sections situated at 2,250 -2,500 metres above sea level and temperatures which vary from 28C down to freezing. Around 1847 the site became the headquarters of one of the first horticultural societies of its kind, converting forest and swamp into the forerunner of today’s stunning site. The garden now grows over 1,000 indigenous and exotic species, including ferns, shrubs, bonsai, ponds and lilies, flowers and lawns. It isn’t far to the equally lush Malampuzha Garden at Palakkad in Kerala. On wildflower tours it is the only rock-cut garden in southern India, with flowering beds, fountains, rose gardens, an irrigation dam and reservoir and for good measure, an aerial rope walkway across the water! This is a wonderfully peaceful and soothing location, notwithstanding the massive sculpture of Malampuzha Yakshi, or female vampire. On Sri Lanka wildflower tours, the main attraction is the Royal Botanical Garden at Peradeniya in Kandy, the capital. This famous 147-acre garden dates from 1371 and is renowned for its magnificent collection of orchids. There are 4,000 other species including spices, medicinal plants and the classical Avenue of Palms. At an elevation of 460 metres and with 200 days of annual rainfall, the garden is beautifully lush. The iconic cannonball tree, so called because its fruit resembles cannonballs, was planted by King George V in 1901. The garden was also used by the Allies South East Asia high command during WW2. Another fabulous collection of orchids and roses can be found at the popular Hakgala garden, in the Badulla region to the southeast. Formerly used for experimental chinchona and tea cultivation, it is now home to 10,000 largely sub-tropical species. This beautiful 70-acre, 1,700 metre high site is dominated by the massive Hakgala Rock standing at 2,200 metres. The garden is arranged in several terraces in the rock and the views are truly outstanding. In contrast, the Henarathgoda Botanical Garden on the west coast near the commercial capital of Colombo sits at sea level. The garden’s 43 acres are well known as a beautiful, green place to relax during wildflower tours. The Mirijjawila Botanical Garden, set up in 2006 to develop and preserve Sri Lanka’s Dry Zone plants is also close to Colombo. With 300 acres it is the largest botanical garden in the country, with the greatest collection of dry zone flora, a butterfly garden with 40 species, 250 types of cactus, 285 trees and 20 birds. Wet Zone species, especially trees, are preserved and researched at Seetawaka Gardens near Avissawella, about 1.5-hours east of Colombo. The garden was only established in 2014 so it is still growing, but with 106 acres and its own lovely irrigation stream, ferns and tea plantations, it makes for a great day out. For those interested in medicinal plants, Ganewatta Medicinal Plant Gardens are a must-see. They are situated at Kurunegala, a similar distance northeast of Colombo and boast an extensive 22-acre collection of medicinal plants from around the world. The site was set up in 2014 to support conservation, economic development and education programs. Mexico City has many botanical gardens and it is a wonderful place to start when exploring this huge, fascinating country on wildflower tours. An excellent jumping off point is the botanical garden in Chapultepac Park that, at 1,700 acres, is one of the largest city parks in the western hemisphere. The Park is wonderfully diverse, with everything from Mesoamerican ruins, lakes, museums and a zoo, to the 600 acre Protected Natural Area. This botanical area is an ecological reserve with 400 indigenous species representing Mexico’s varied ecosystems, from arid zones to wetlands, and local wildlife. There is an arboretum with a superb tree collection, a flower garden and a greenhouse crammed with tropical plants. The Park also includes the justly world-famous Museum of Anthropology, an essential stop-off for anyone visiting the city. Equally important is the Botanical Garden of the Institute of Biology. Mexico has a largely arid or semi-arid landscape and the garden reflects this with its exceptional collection of cactus, yucca, agave and other succulents, in beautiful dark volcanic rock settings. There are 1,600 plant species, including 300 which are threatened or endangered. The 550-acre garden, the second oldest in the country, is part of the university and it is deeply involved in conservation, promotion of biodiversity and research. There are superb artificial waterfalls and great bird watching too. While you are in Mexico City try to visit the Mercado Jamaica, where a massive flower market is staged adjacent to the regular food market, with hundreds of flower vendors and thousands of varieties for different occasions. For orchid enthusiasts, these prolific and ever popular flowers grow all over Mexico’s varied landscape and nowhere better than in the San Miguel area of Guanajuato, the centre of orchid production in Central Mexico. There are hundreds in the legendary Stirling Dickenson Orchid Garden and the orchid market in the town is well worth investigating on Mexican wildflower tours. The Charco del Ingenio Botanical Garden overlooks San Miguel, with 220 acres of protected native vegetation. It is named after the deep canyon at the bottom of the garden and offers a wonderful hiking, botanical and wildlife experience which includes the brilliant Conservatory of Mexican Plants, housing an outstanding collection of cactus and succulents. To the west on the Pacific coast, Puerto Vallarta in home to the Vallarta Botanical Garden, with 64 acres of superb attractions. Orchid conservation and propagation is a major occupation here and there is an Orchid and Vanilla House as well as exotic species from around the world. You can hike though native forest, swim in the tropical Rio Horcones, go bird watching, or join in the Butterfly Festival from August to October. There is even an International Peace Garden and it is no wonder that in 2013 Vallarta was selected as one of ‘North America’s top 10 gardens worth travelling for’. At the same distance from Mexico City, about 250 miles but to the south east, you will find more orchids at La Encantada Orchid Gardens a few miles from Oaxaca. There are 1,200 varieties on display in this enchanted, privately owned labour of love. As well as the orchids there are ferns, various air plants like bromeliads and epiphytes and a bamboo forest. Oaxaca is also home to the beautiful Ethnobotanical Garden. This is one of the most bio and culturally diverse regions in Mexico, and the garden is themed brilliantly to demonstrate the relationships between the plants, peoples and cultures of the area. The ruins found in the garden have been tastefully included and only add to this exceptional experience on wildflower tours. Further north on the Gulf coast and 200 miles from Mexico City, at Xalapa in Vera Cruz state, look out for the Jardin Botanica Francisco Javier Clavijero. Despite its impressive name the garden is only 19 acres, but it is one of the most important in Mexico. It includes endangered rainforest and 4,000 specimens coering 750 different species in a range of environments, 40% of which are endangered. This beautiful, relaxing place has become an outstanding environmental education centre. Further south, the Orquideas Maxviquil Garden at San Cristobal de las Casas has the ‘wow’ factor. Its mission is to safeguard and promote the amazing flora of the Chiapas region, with a special focus on orchids and air plants. There are several thousand species, plus many imported species of mushrooms and a stunning hike though their beautiful oak forest. The Jardin Botanica in the heart of Guatamala City is the only botanical garden in the country, but it was the first of its kind in Central America. At 4.5 acres it is also one of the smallest, but it is home to 1,400 species of plants and trees from all over the world, many of them endangered. On wildflower tours these garden offers a well organised and tranquil respite from the commotion of this busy city, in which you can see the ceiba, Guatemala’s national tree, and a huge 100-year-old euforbia plant. It is part of the University, promoting conservation and education, and entry includes the Natural History Museum. The 45-acre Belize Botanic Garden is 10 miles west of San Ignacio, on the banks of the Macal River in the beautiful Mayan Mountain foothills. Here they conserve and protect the floral bio-diversity of Belize, encouraging sustainable horticulture, conservation and education. The Orchid House contains hundreds of indigenous species and you and learn about the plants of the Mayans, and how this ancient civilisation used them for ritual, medicine and daily life. The Cave Branch Botanical Garden specialises in epiphytes and bromeliads, with the largest collection in the country. They grow Belize’s national flower, the Black Orchid. Jardin Botanico La Laguna is a lush 7.5-acre garden beautifully situated inside the crater of an extinct volcano just outside the capital, San Salvador. This stunning sprawling park houses 3,500 species of native and exotic plants, with 35,000 specimens in the herbarium. As well as a superb collection of ferns, trees, orchids, medicinal and desert plants and native vegetation, the animal life includes huge iquanas, fish, turtles and a variety of birds. On wildflower tours you can also take a ride to the 6,200-foot summit of the San Salvador Volcano and enjoy the wonderful scenery of Boqueron National Park. The extraordinary, immense Lancetilla Botanical Garden and Research Centre near Teta on the Caribbean coast is the second largest tropical botanical garden in the world. It is divided into huge sections, with a 190 acre arboretum housing 640 species of Asian fruit plants, one of the largest collections in the world. The Experimental Plantation is 7,700 acres and contains more than 60 species of timber trees and a first-class training and research facility. A further section for Biological Research covers 3,070 acres and comprises 85% unexplored second-growth forest, with plant and animal life to match! Split into tropical and subtropical zones this accessible forest is home to puma, howler monkeys, wild cat, deer and 250 bird species, plus any number of reptiles, fish and insects. If you travel to Honduras, on wildflower tours do not miss this amazing place dedicated to the conservation and presentation of the country’s outstanding flora and fauna. The Carambola Gardens and Nature Reserve is a little smaller at 40 acres, but equally beautiful. Situated on Roatan Island off the Caribbean coast, the garden boasts gorgeous flower gardens and trails through dense tropical rainforest. There are stunning views from the very hike-able summit of Carambola Mountain, including a birds eye view of one of the world’s great barrier reefs. There are bridges and creeks, the famous chocolate tree and the unmissable Honduran Mahogany tree. Hike or birdwatch through flowering plants, orchids, medicinal plants, exotic spices and fruit and nut species. The Ambiontal Botanical Garden in the grounds of the National Autonomous University of Nicaragua (UNAN) is probably the most accessible for wildflower tours. It is in Leon, which is one of the loveliest and oldest colonial town on the continent. The garden covers 30 acres, with two miles of tranquil walks and native plant and bird species. There are many botanical gardens in this lush country, and you can begin wildflower tours at the Lankester Botanical Garden at Cartago, southeast of the capital of San Jose. It is part of the University of Costa Rica and, though open to the public, its 27 acres is a major orchid research centre for the whole Caribbean region, with over 1,000 varieties and 3,000 plant species in total, including cacti and other succulents. Orchids are epiphytic and grow anywhere on their host trees, but these are all at eye level and something is in bloom all year round! Also near to San Jose, to the northwest, is Botanical Orchid Garden la Garita at Alajuela. This small, peaceful and well laid out garden houses hundreds of orchids, plus other tropical plants like tigerclaw, beehive ginger, prayer plant, cinnamon and vanilla. Unusually, it also has a small aviary for rescued pet birds like the scarlet macaw, sulphur-crested cockatoo and very rare golden parrot. Whether you are a gardener or a birder, this park has much to offer. If you are near San Jose, it is well worth a detour. The Pura Vida Gardens & Waterfall, situated inland from Jaco on the Pacific Coast, is a higher and larger site with 60 acres and includes a lovely ridgeway mountain walk at 2,000 feet. It contains 400 species of endemic and exotic plants and the Bijagual Falls, one of the largest in Costa Rica. The prime rainforest and the views are outstanding. If you like your orchids small, then the Monteverde Orchid Garden in Santa Elena in the far northwest is an absolute must-see. The garden specialises in indigenous miniature orchids and has 460 native species, some less than 2 cms wide, including the smallest in the world. They are mostly from the surrounding Monteverde Cloud Forest and this lushly beautiful ‘green mountain’ must be seen while you are here on wildflower tours. The Wilson Botanical Garden at San Vito near the Panama border in the south, is the best known in Central America. This huge private site covers 850 acres of natural forest and 25 acres of landscaped gardens and includes 2,000 Cost Rican plant species. There are many self-guided walks where you can see exotic species such as orchids, bromeliads and medicinal varieties. With 700 varieties of palms, they possess the second largest collection of these species in the world. There is also an exceptional population of rare birds, so birders will also have a great time. Further north, at Puerto Viejo de Talamanca on the Caribbean Coast, also close to Panama, you will find the delightful Finca La Isla Botanical Garden and working farm. This beautifully diverse permaculture park has set out to be a model of sustainable, organic and commercial farming. There is an exceptional collection of fruit and spice trees, tropical plants and rainforest paths to wander and they make Talamanca chocolate from their own cacao beans. The wildlife includes sloths, agoutis, bats and a lot of eye-catching poison dart frogs! The bird life again makes this another must for birders. One of the main attractions in Panama is Summit Municipal Park, just outside the city. In total the park extends 620 acres and the botanical garden takes up 140 acres. There is an impressive collection of 4,000 tropical and subtropical plants from Panama and around the world, covering 350 different species. Also a good selection of trees including palms, teak, mahogany and cannonball, named after the shape of its fruit. The park encloses an excellent zoo and wildlife rescue centre which is famous for its huge Harpy Eagle breeding enclosure. The Harpy is the world’s most powerful bird of prey and the national bird of Panama, but it is highly endangered and the zoo’s breeding programme is vital to its survival. Whether you are interested in plants, architecture or culture during your wildflower tours, you must see the stunning new Biomuseo when you visit Panama. Situated on the causeway at the southern end of the Panama Canal, this amazing project highlights Panama’s natural and cultural history. It has been progressing in stages but the 6-acre botanical garden which surrounds the main building is open for exploration. The museum tells the story of the rise of the Panama landmass and the closing of the isthmus, a bio-geological event of global importance. It includes 10-metre-high aquariums depicting the two great oceans which were separated as a result. Finca Los Mones is a beautiful lush private garden on Isla Colon, the largest of the Bocas del Tora archipelago off the far east Caribbean coast. Its stunning 24 acres displays a wonderful collection of tropical plants including gingers, heliconias, palms, flowering trees, calatheas, fruits and spices. The garden spans a narrow section of the island and the views, either over the Caribbean or the mainland mountains, are outstanding. Medellin is not far from the Panama border and the Orquideorama Botanical Garden there is well worth a detour. Located in the city, it is convenient and free, with 4,500 plants covering 1,000 species in its 35 acres. The garden houses an important orchid collection, a tropical garden, a butterfly house, cactus garden, lagoon, maze and a population of large free roaming iguanas. It also boasts the amazing orquideorama, a stunning modular wooden structure of flower-trees which dominate the gardens. They protect the collections and gather irrigating rainwater, adding an innovative modern element to what is an interesting family space with lots going on. Bogata Botanical Garden, in the capital, is the biggest and most famous in the country, with 19.5 acres devoted to recreation, research and preservation, especially of plants from the Andean ecosystems. Its 19,000 plants include specimens from every part of Columbia. It is divided into regions, with a beautiful rainforest room, an extensive greenhouse network, rose garden, orchids and a wide selection of Amazonian flowers. There is a palmetum (for palm research) and a sun clock. On wildflower tours it is an oasis of tranquillity in the heart of this busy city, complete with waterfall and a large population of exotic birds to help you to relax. The Quindo Botanical Garden is in Armenia, 100 miles west of Bogata and boasts an easy-walking rainforest in the middle of the city. Within its 36 acres there are 600 plant species including strangler figs, vines, an excellent palm collection, cloud forest plants and trees, ferns, heliconia and orchids. It is also famous for its huge butterfly house, with up to 2,000 covering 50 different species. With a wide range of tropical birds, the birders will have a wonderful time here too. The Sabio Mutis Agropark is the newest of Columbia’s many botanic gardens, with 50 acres about an hour from Bogata in the La Mesa and Tena region. After much research the garden was established to pursue conservation, sustainability and research for the protection of the country's biodiversity. It is in tropical cloud forest and dry broadleaf forest, incorporating various ecosystems that includes 530 orchid species, bromelia, cactus, sugarcane vivarium and a museum. As with most gardens in this part of the world, the bird life is also extraordinary. Quito is the home of a small but beautifully designed botanical garden in the main Parque Carolina, the capital’s ‘Central Park’. The garden’s objective is to cultivate, conserve, exhibit and educate and its 4.5 acres are cleverly arranged to mirror the country’s various ecological regions, especially Andean flora. There are 3,500 orchid species in Equador and these are represented by the 1,200 in the garden’s outstanding orchidarium. The ornamental gardens include zen, rose and bonsai and there are giant tree ferns, colourful flowers, a babbling brook and a lovely pond. The garden is one of Quito’s gems and must not be missed on wildflower tours! Guayaquil is a lively, vibrant city in the west and is host to a 12-acre botanical garden which is also dedicated to ecosystem conservation and education. Once again orchids are a major attraction, with 50 species on display, together with native bromeliads, heliconias, lotus flowers and nepenthe - a carnivorous plant from Madagascar. In total there are 330 plant species, which also include timber and fruit trees, ornamental and exotic plants, palms and cacti. There are also wonderful birds of course, with 73 species so far recorded. The Reinaldo Espinosa Botanical Garden is a few miles from the centre of Loja in the south, near the Peru border. This lovely garden of 17 acres is the oldest in Equador and includes 900 plant species, including many Andean varieties, as well as a superb range of trees and landscape diversity. There is an orchid garden, ornamental ponds, a stepped irrigation canal, waterfalls and lovely thatched shelters for resting and contemplating this peaceful place. The Felipo Marin Moreno Botanical Garden is in Pisac at the southern entrance to Peru’s Sacred Valley, on the way the Inca city of Machu Picchu. Pisac has its own fabulous Inca remains, but garden lovers can also check out this small slice of Peruvian nature. It is a well-kept old colonial enclosed garden, with an impressive collection of native and imported plants and trees, including 12 varieties of cantua, the national plant. There is also a small sample (just 200) of the over 3,000 different varieties of indigenous potatoes! On wildflower tours you can wander the narrow paths in the company of colourful butterflies, birds, bees and insects, away from other tourists and Pisac’s famous but busy market. Las Jardins de Mandor Botanical Garden at Aquas Calliantes is another peaceful haven, with breath-taking scenery and a series of beautiful waterfalls. Jardin Botanico de Santa Cruz has 450 acres of beautiful, well preserved forest close to Bolivia’s second city. It is full of plants and trees, including many indigenous species and has 4 miles of hiking paths. There is a fine orchid collection, a cactus garden, palms, a lagoon with resident caiman, sloths and great views. The birds are outstanding too and this is most definitely the place to wander, relax and lose yourself for a while. The capital La Paz has a lovely 10-acre garden like a city park, with 1,000 species reflecting Bolivia’s exceptional eco-diversity, said to be the most varied in South America. It has been developed to provide greater public awareness of ecology, nature and conservation. You can enjoy palm trees, rosales, cactus, orchids, plus greenhouses, an ornamental section, medicinal plants and an aquarium. The Martin Cardenas Botanical Garden in Cochabamba, not far southeast of La Paz, is a small but beautiful city centre garden with 200 species of exotic cactus, including many which are endemic. There are bromeliads, shrubs and trees from around the world, an arboretum and national herb forest housing 40,000 varieties. The national plant, the cantua, is again on display. The Manaus Botanical Garden MUSA (Museum of the Amazon) is part of the immense Adolpho Durke Forest Reserve, the largest in the world, with 25,000 acres on the outskirts of Manaus in the heart of the Amazon. The garden is a 1,235 acre sealed off area of natural rainforest and offers a superb variety of tropical trees and flowers. It is the perfect way to experience this fantastic ecosystem if you don’t have time to explore the real thing. One outstanding feature is the 42-metre canopy tower which, despite being a challenging climb, provides magnificent views of this iconic environment and its flora and fauna. There are themed gardens including palmeiras, aroids and heliconias, a huge variety of orchids and a beautiful lake and aquarium. The garden is beautifully maintained and is staffed by particularly knowledgeable and friendly botanist guides. A wonderful place on wildflower tours which is not to be missed. The capital Brasilia has its botanical garden, in a beautiful and serene location 11 miles from the city. There are different sections to reflect Brazil’s various habitats that are stocked only with indigenous species. The Japanese garden is outstanding and orchids are again well represented in an orchidarium and an orchid garden. A medicinal plant garden is also included, with 100 species of native herbs. The Jardim Botanico do Rio de Janeiro is a 130-acre Unesco Biosphere Reserve with 6,500 specimens of Brazilian and foreign flora, many of which are endangered. The garden includes numerous greenhouses and striking historical, artistic and archaeological monuments and sculptures, including the cast iron Fountain of the Muses, made in Derby in the UK. There are 900 species of palm, including the magnificent 750 metre Avenue of Royal Palms, which leads you in from the garden entrance. The collections here include bromeliads, orchids, carnivorous plants and cacti, and the garden is home to Brazil’s immense Botanical Library. Look out for the Japanese garden and the Victoria lilies in the Lago Frei Leandro Pond, which is also home to the super-friendly capibaras, the world’s largest rodent. With 140 largely human-friendly bird species, this is also a birder’s paradise and the garden is a must-see when you visit this stunning city. In the commercail capital of Sao Paulo, the Jardim Botanica de Sao Paulo is one of the largest in the country at 400 acres. It is beautifully designed with orchids, including an orchidarium, ornamental aquatic plants, mushrooms, palms, fruit and timber trees. There is a botanical museum, lovely roads and trails, sculptures and thriving wildlife including turtles and huge lizards. The Botanical Garden of Guritiba, in the far south of the country, comprises 60 acres of stunning variety in the style of French gardens. There are fountains, waterfalls, lakes and an enormous Art Nouveau greenhouse reminiscent of London’s 19th century Crystal Palace, that is undoubtedly the centrepiece. For something a little different on wildflower tours, the Franz Krajcberg museum behind the greenhouse beautifully displays the work of this Polish Brazilian artist who championed environmental conservation here. The garden’s Botanical Museum, with the fourth largest herbarium in Brazil, is a world-renowned reference collection of indigenous flora, while the native forest is cleverly laid with paths for strolling and enjoying the lovely surroundings. The Metropolitan Park in the capital Santiago is one of the largest urban parks in the world and includes the 10-acre Mapulemu Botanic Garden. It contains 80 different plant species from various regions of Chile, gravel paths and restful corners. There is a medicinal plant garden and nearby you will find a beautifully landscaped Japanese garden. The park is located high on the Cerro San Christobal and the city and mountain views are outstanding. Not far away near the port of Valparaiso, you will find the National Botanical Garden at Vina de Mar, which is also the country’s most popular beach resort. The garden takes up 80 acres of a huge 1,000-acre area of natural vegetation, in which a wide range of plants and trees, some of which are huge, are cultivated. There is a cactarium with 670 plants covering 60 Chilean species and a cactus garden, plus a herbarium and arboretum. Collections include bosue, valdiviano, medicinal plants, fuchsias and roses. The environmental and walking trails are fun and the more adventurous can try the canopy walkway and ziplines. And there is always the beach. 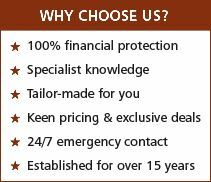 trees, shrubs and conifers that are easily accessed through lovely paths and river walks. A great place for a peaceful wander on wildflower tours. The capital of Buenos Aires is home to 250 parks and open spaces, with Palermo Woods Garden in the city centre being the largest at 900 acres. It includes a world renowned Japanese garden, complete with pond, traditional bridge, teahouse and irises; the Rosedal - a stunning rose garden with 8,000 bushes and 93 species; and the famous White Bridge. There is even a Poets Garden with stone and bronze busts of renowned poets including William Shakespeare. Better known as the Parque Tres de Febrero, in honour of the date in 1852 when the local oppressive landowner Juan Manuel de Rosas was overthrown, the park also encloses the Buenos Aires zoo, the city planetarium, lakes, beautiful groves and its famous jacaranda trees. The Buenos Aires Botanical Garden is an 18-acre city centre garden with 6,000 species of plants, trees and shrubs from around the world. There are also monuments, sculptures and five greenhouses, one of which is a superb, huge Art Nouveau structure imported from France. This lovely building is said to be the last surviving of its kind in the world. The plants are arranged by style with Roman, French, European, Oriental, Argentinian and American varieities all represented in different areas. This means that there is a wonderful mix of varieties such as cypress, poplar, ginkgo, biloba, acacia, eucalyptus, casuarina, jacaranda, coral, oak and sequoia. The French garden is based on 17th and 18th century designs. The Municipal Gardening Schools is here, as well as the Botanical Museum and an extensive library. Don’t miss the Argentinian flora walk and the Butterfly Garden on wildflower tours. The Costanera Sur Ecological Reserve is another large garden close to the city. With 850 acres, this exceptionally biodiverse wilderness style garden houses a huge variety of trees, herbs, plants and shrubs. There are 500 species of native vegetation including pampas grass, meadows and elder forests, while several winding paths and three lagoons add to the remarkable tranquillity here. The 300 species of native and exotic birds make this yet another birders paradise. For cactus lovers the astonishing Chiran Mita Botanical Garden, at Chilecito northwest of Cordoba, is a must on wildflower tours. This unique 5-acre garden museum houses hundreds of plants covering over 1,200 species from locations all over Latin America. The garden is brilliantly terraced with Inca style drystone walls and includes the giant Mexican cardon, as well as many other succulents such as aloe vera. Uruguay’s botanical claim to fame is undoubtedly the Arboretum Lussich near the capital Montevideo, one of the most important forest reserves in the world. Its beautiful 470 acres are home to 400 exotic and 70 indigenous species including cypress, pine, juniper, acacia, eucalyptus and many more. Montevideo Botanical Garden is a 31 acre centre for scientific activities with a range of Uruguayan plant species and vegetation. On wildflower tours this garden offers pleasant trails, beautiful fountains with lily pads and sculptures. The small but authentic Japanese Garden in the grounds of Blanes Art Museum in Montevideo is one of the most beautiful places in the city. It is located in the popular El Prado district, a lovely green neighbourhood renowned for its sumptuous houses and gardens. The Botanical Garden, combined with the zoo, is located in the capital of Asuncion. It specialises in native plant species, especially the beautifully lush Paraguayan trees. There is also a major nursery cultivating over 500 species, including many medicinal types and the zoo is unusual for its remarkable collection of big cats. Visit Kgalagadi Transfrontier Park in South Africa, home of the Bushmen, on this terrific self-drive holiday. 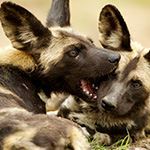 See the majestic black-maned Kalahari lions, oryx & other desert-adapted wildlife, as well as the granite Augrabies Falls & the wildflowers of Namaqualand in season (Aug/Sept). You can also explore the Richtersveld & Port Nolloth. From July to October, this seasonal Cape Town self drive holiday focuses on whales, wildflowers & wine tasting. 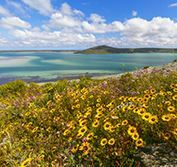 After ascending Table Mountain, view penguins at Cape Point & drive up the West Coast to see the wonderful wildflowers at Langebaan Lagoon. Continue to the beautiful Stellenbosch winelands to enjoy some wine tasting, before ending your holiday viewing whales in Hermanus. Travel off the beaten track exploring the West Coast. Begin in the vibrant city of Cape Town, before journeying to unspoilt Langebaan Lagoon where thousands of sea birds roost & wildflowers bloom (Aug/Sept). View the dramatic Cederberg Mountains & historic Swellendam, one of the oldest towns in South Africa. Then relax in the winelands of Franschhoek. In August & September, you can explore the beautiful Namaqualand Wildflowers of South Africa on our self-drive holidays & tours. Starting in Cape Town, ascend Table Mountain, see the Cape Point penguins, view whales in Hermanus & enjoy wine tasting in Stellenbosch. Then drive up the West Coast to Langebaan & the Kalahari to view the spectacular wildflowers, visit Augrabies Falls & stay at a lodge in Kgalagadi Transfrontier Park. Begin your exploration of the flora of South Africa in Johannesburg, with visits to two famous botanical gardens. Then drive to the beautiful Drakensberg Panorama Route to see the cycads & wildlife of the Kruger Lowveld region. Fly on to Durban to see its orchids & other tropical plants, before finishing in the Cape - home to Kirstenbosch, Harold Porter & Karoo Botanical Gardens. 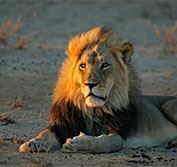 Travel with your own Private Guide on this wonderful Kruger Park Safari and Cape Town holiday in scenic South Africa. Explore the wildlife & birds of this world famous region, including the Blyde River Canyon. Travelling at your own pace, this holiday is ideal for special interests such as birding, botany & photography, or if you have limited mobility. All park fees, game viewing & specified sightseeing included. Explore northern Madagascar, travelling overland in a 4x4 vehicle. Enjoy the spectacular flora of Montagne d'Ambre National Park, the best place to see crowned lemurs, chameleons, frogs & geckos. Visit the Great Tsingy of Ankarana & Andisibe-Mantadia. Complete your holiday relaxing on turquoise Nosy Komba island. English speaking guides, transfers, local flights & park fees included. 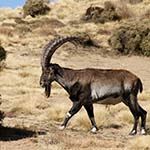 This holiday explores the flora & fauna of fascinating Ethiopia, including visiting the rock-hewn churches of Lalibela, Gondar & the high altitude Simien Mountains, home to the endangered Walia Ibex and Bale Mountains National Park, which is the best place in the country to see the Ethiopian Wolf. Enjoy the unique alpine flora of these regions & their birdlife. All transfers & English speaking guides included. 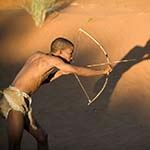 Explore the amazing landscapes & wildlife of the vast Kalahari with your own private driver/guide. 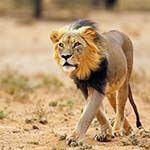 Kgalagadi Transfrontier Park is home to an array of unusual wildlife including the majestic black-maned Kalahari lion, oryx & springbok. View the thundering Augrabies Falls & during August & September you may see marvellous displays of Namaqualand wildflowers. English speaking guide, all park fees & game drives included. This seasonal private tour from Cape Town visits the spectacular wild flowers of Namaqualand, which flower from mid August to mid September each year (although exact timing depends upon the spring rains). Also whale watching off the West Coast; scenery & night skies of remote Richtersveld & Karoo; and Kgalagadi Transfrontier Park in the Kalahari. Less 10% for 4+ pax.